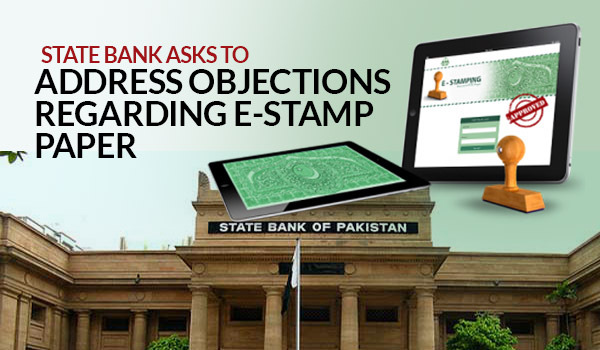 Lahore: State Bank of Pakistan (SBP) has asked the Government of Punjab in writing to address the objections raised by the banks on electronic stamp paper project, states a news source. According to details, the SBP has formally told the Punjab Government that banks weren’t taken into confidence about the project; hence the government needs to form a standard operating procedure and share it with SBP and all branches of National Bank of Pakistan. Reportedly, SBP has also asked the government to arrange a meeting with all the stakeholders to avoid any future complications that may arise regarding the e-stamp paper system. Furthermore, SBP has notified the Punjab Government that users are also facing difficulties due to lack of clarity about how the e-stamp system will actually work.